- Cyrix / IBM 6x86, 6x86L, 6x86MX (M2). - AMD K5, K6 and other compatible CPUs. * Chipset : SiS 5582. * Supports 512K Pipelined Burst SRAM in Second Level Cache. * Supports 4 x 72-pin SIMM Sockets and 2 x 168-pin DIMM SDRAM or DRAM Sockets. - The Memory size from 4MB to 384MB. - Supports Fast Page Mode (FP) and Extended Data Output (EDO) DRAM. * Six 16-bit ISA Slots and Two 32-bit PCI Master Mode Slots. - PIO Mode 4 transfers & Ultra IDE Mode. - PCI Bus Master Mode IDE interface. * Universal Serial Bus Controller. - Host / HUB Controller. - 2 Serial Ports (16550 Fast UART compatible ). - 1 Parallel Port ( ECP and EPP capabilities ). - 1 Floppy Disk Controller ( Supports Two FD Drivers ). - 1 PS/2 Mouse Connector. 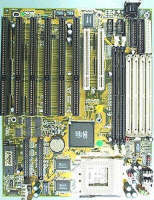 * Flash ROM BIOS with Green, Plug and Play Features. * Baby AT Form Factor : 22cm x 28cm or 8.7" x 11" (4 Layers).